Ready in 12 minutes with low fat crème fraiche. Boil the pasta according to the packet instructions, adding the frozen petits pois 2 minutes before the pasta is cooked. Meanwhile, cook the salmon. If you have a steam basket, steam it over the pasta pan for about 7 minutes; otherwise microwave it on high for 2–3 minutes until the flesh flakes easily. 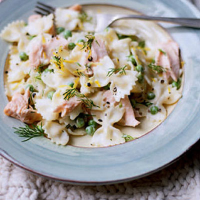 Drain the pasta and petits pois then return to the pan, off the heat, and add the lemon zest and juice, the dill and crème fraîche. Flake in the salmon, then gently toss everything together. Season, sprinkle over some extra dill and serve.